For other uses, see Oh Happy Day (disambiguation). 1967, Ephesian Church of God in Christ, Berkeley, California, U.S.
(1968) "All God's Children Got Soul"
"Oh Happy Day" is a 1967 gospel music arrangement of an 18th-century hymn by clergyman Philip Doddridge. Recorded by the Edwin Hawkins Singers, it became an international hit in 1969, reaching No. 4 on the US Singles Chart, No. 1 in France, Germany, and the Netherlands and No. 2 on the Canadian Singles Chart, UK Singles Chart, and Irish Singles Chart. It has since become a gospel music standard. The recording begins with a muted piano, drum, and bass backing lead singer Dorothy Combs Morrison on the left-hand stereo channel, then alternates twice with a full-throated chorus that includes a large ensemble, and ends with a return to the muted sound at the beginning. The track is notable for its clear sound given the powerful vocals and the modest equipment used to capture them. It was made at Hawkins' church, the Ephesian Church of God in Christ in Berkeley, California. 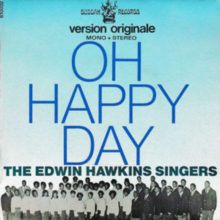 ✪ Oh Happy Day - The Edwin Hawkins Singers - Very good! 4 time and this new arrangement by Hawkins, which contains only the repeated Rimbault refrain, with all of the original verses being omitted. The B-side of the single was Hawkins' own modern arrangement of "Jesus, Lover of My Soul" originally written by Charles Wesley in 1740. Hawkins' arrangement quickly became a “standard” and has been recorded by hundreds of artists. It was included on the RIAA Songs of the Century list and won Hawkins a Grammy Award for Best Soul Gospel Performance in 1970 (performed by the Edwin Hawkins Singers). In live performances and acoustic versions of the Nick Cave song "Deanna" (1988), portions of "Oh Happy Day" are included, revealing the inspiration for Cave's song. George Harrison has stated the song was a primary inspiration in the writing of his 1970 international hit single "My Sweet Lord." The song has appeared in many movies, beginning with the German film Seventeen and Anxious in 1970, but most notably Whoopi Goldberg's Sister Act 2, with then-17-year-old Ryan Toby singing lead. The song also appears in Big Momma's House, Nutty Professor II: The Klumps, David LaChapelle's 2005 movie Rize, Robin Williams’s 2007 movie License to Wed., the 2010 biographical film produced by Walt Disney Pictures: Secretariat, and Spike Lee's BlacKkKlansman. The song is regularly performed by space-rock band Spiritualized as the last song of their live sets; their version can be heard on the 1998 live album Royal Albert Hall October 10 1997. The song was also included on the album Let Us Go Into the House of the Lord (1968). It was released as a 7" single on Pavilion Records in April 1969, then on the Buddah Records album It's A Happy Day also in 1969. Joan Baez performed the song at Woodstock in 1969. Quincy Jones covered the song on his 1969 album Walking in Space. Glen Campbell covered the song in 1970, reaching number 40 on the U.S. Billboard Hot 100, number 7 AC, and number 44 in Canada. Nana Mouskouri covered the song on her 1990 album Gospel. Club Nouveau included the song on their 1992 album A New Beginning. The single charted at No. 45 on the US R&B Chart. ^ W. K. McNeil (2013-10-18). Encyclopedia of American Gospel Music. Books.google.co.uk. p. 115. Retrieved 2016-10-02. ^ a b c d Myers, Marc (2012-11-23). "When He Washed My Sins Away". Wall Street Journal. ISSN 0099-9660. Retrieved 2018-01-23. ^ P. Doddridge and E. F. Rimbault, "Happy Day", in Joseph Flintoft Berry and Charles H. Gabriel (1914), edd., Hymns of the Heart, New York: Methodist Book Concern, Hymn 134. ^ "The Army and Navy Hymnal/Hymns/Jesus, Lover of My Soul - Wikisource, the free online library". En.wikisource.org. Retrieved 2016-10-02. ^ "The Edwin Hawkins Singers - Oh Happy Day / Jesus, Lover Of My Soul - Buddah - UK - 201048". 45cat.com. 1969-05-17. Retrieved 2016-10-02. ^ Hawkins Grammy Award 1970, Washington Post. ^ DeMain, Bill. "George Harrison’s 'My Sweet Lord' Copyright Case". Performing Songwriter. Retrieved 2013-01-30. ^ Sister Act 2: Back In The Habit, IMDB Soundtrack Track Listing. ^ Big Momma's House, IMDB Soundtrack Track Listing. ^ Nutty Professor II: The Klumps, IMDB Soundtrack Track Listing. ^ "Various Artists, Flii Stylz, Dizee Rascal, Christina Aguilera, The Edwin Hawkins Singers, Dap & Planet Asia, The Blind Boys Of Alabama, The Caravans, Alice Ridley, Lil' C & Bloezarf - Rize - Music From the Original Motion Picture - Amazon.com Music". Amazon.com. Retrieved 2016-10-02. ^ "License to Wed Soundtrack Track Listing". IMDb.com. Retrieved 2016-10-02. ^ "Image : RPM Weekly - Library and Archives Canada". Bac-lac.gc.ca. Retrieved 2016-10-02. ^ "Offiziellecharts.de – Edwin Hawkins Singers – Oh Happy Day". GfK Entertainment Charts. ^ "The Irish Charts – Search Results – Oh Happy Day". Irish Singles Chart. ^ "flavour of new zealand - search listener". Flavourofnz.co.nz. 1969-08-08. Retrieved 2016-10-02. ^ "SA Charts 1965 - 1989". South African Rock Lists. Retrieved 17 January 2018. ^ "Edwin Hawkins Singers: Artist Chart History". Official Charts Company. ^ "The Edwin Hawkins Singers Chart History (Hot 100)". Billboard. ^ "Edwin Hawkins Singers Chart History (Adult Contemporary)". Billboard. ^ "Edwin Hawkins Chart History (Hot R&B/Hip-Hop Songs)". Billboard. ^ "Item Display - RPM - Library and Archives Canada" (PDF). Collectionscanada.gc.ca. Retrieved 2018-08-18. ^ "Top 100 Single-Jahreschart 1969". offiziellecharts.de (in German). Retrieved 2018-09-22. ^ "Top 100 1969 - UK Music Charts". Uk-charts.top-source.info. Retrieved 2016-10-02. ^ "Top 100 Hits of 1969/Top 100 Songs of 1969". Musicoutfitters.com. Retrieved 2016-10-02. ^ "The Edwin Hawkins Singers* - Let Us Go Into The House Of The Lord". Discogs. Retrieved 15 January 2018. ^ "The Edwin Hawkins Singers* - Oh Happy Day". Discogs. Retrieved 15 January 2018. ^ "The Edwin Hawkins Singers* - It's A Happy Day". Discogs. Retrieved 15 January 2018. ^ "Club Nouveau - Chart history". Billboard. Retrieved 12 July 2017. "I'll Go to My Grave Loving You"
"Do You Know You Are My Sunshine"
"Who Am I to Say"
"How to Be a Country Star"
"Nothing as Original as You"
"You'll Be Back (Every Night in My Dreams)"
"A Child of the Fifties"
"(Oh Baby Mine) I Get So Lonely"
"Too Much on My Heart"
"The Best I Know How"
"Let's Get Started If We're Gonna Break My Heart"
"More Than a Name on a Wall"
"Too Late to Worry - Too Blue to Cry"
"Dreams of the Everyday Housewife"
"Everything a Man Could Ever Need"
"Dream Baby (How Long Must I Dream)"
"The Last Time I Saw Her"
"I Say a Little Prayer"
"Country Boy (You Got Your Feet in L.A.)"
"Don't Pull Your Love/Then You Can Tell Me Goodbye"
"I Love How You Love Me"
"It's Just a Matter of Time"
"I'm Not Gonna Miss You"
"We Got a Love Thang"
"Keep Givin' Me Your Love"
"Before I Lay (You Drive Me Crazy)"
"In Love with a DJ"
"I Know You Want Me"
"I Can't Go for That"